In the night, once the paper traders of Chawri Bazaar have downed their shutters and the throb of commerce has quietened to a murmur, Hira Lal Chaat Waale‘s shop stands out like a beacon by a darkening sea. Incandescent lamps light up a stack of fruits in a blaze of colour, and the warm aromas from the griddles draw you irresistibly in. For four generations, people have come here for their choice snack — alu chaat, fruit chaat, alu tikkis, and even pao bhaaji. You can get your kuliya made from cucumber, sweet potato (shakkarkandi), tomato, potato, apples, and if Shashank is to be believed, even pineapples in season. My favourite though, is the banana, which is slit lengthwise to allow space for the fillings, and provides the ideal contrapuntal sweetness to the sour masala. You could call it an authentic, All-Indian Banana Split! Of course, Hira Lal’s is not the only place you can get your kuliya. As a matter of fact, just a few paces away on the other side of the street is another popular chaat shop, this one named Jugal Kishore Ramji Lal. This too has been around for four generations, and by Asmita’s account, they do a fine job of their kuliya. Her description revealed a slight difference in the recipe — they apparently fry their chick peas, while Hira Lal’s place likes to simply boil them. Sadly, they tend to shut shop a little earlier in the evening, so when I was in those parts last weekend, I didn’t get a chance to give them a try. But I will, next time! Price: Rs. 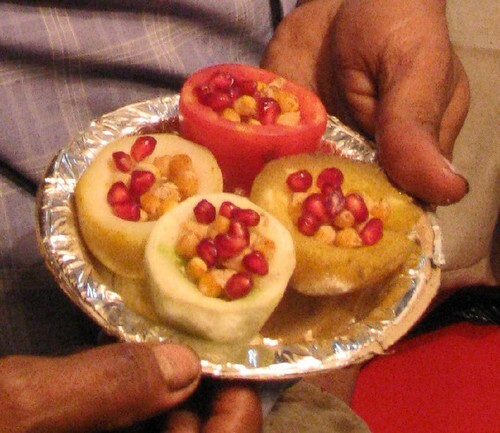 30 for a small plate, but prices tend to vary depending on what fruit or vegetable the kuliya uses as a base. Timings: Hira Lal’s shop shuts by 10pm at night, and tends to remain open all days of the week. Jugal Kishore Ramji Lal certainly shut shop by 9pm, perhaps much earlier. Location: On the Chawri Bazaar main road, somewhere between Hauz Qazi Chowk and the intersection with Nayi Sadak. Close to Raghuganj. I’ve marked it approximately on our Google map here. after doing lots of search online, i have made this list, i am coming to india on 24th of feb, and i m planning to visit these places. its good to see that you guys go to different kinds of shops and areas, i have taken so many ideas from your blog. keep it up and let me know if i m missing something. bangla sahib gurudwara-cp..nearest metro station..rajiv chowk..
rakab ganj gurudwara-near cp..nearest metro station center secritrait..
famous faluda kulfi in karol bagh too..
adlabs movie theaters,fun cinema’s…for movies..
delhi haat..its far can go by auto..nearby south delhi..sarojni nagar..
momo’s point in kamala nagar..on banglow road..behind market..
Ap ki Pasand in daryaganj main road. lajpat nagar market..can go by auto itself..
And I thought Jumman Chaat Waala at Zakir Husain College had invented the ‘kuliya’. Jumman Chaat shop has been around for at least 30 years, if not more, first in the old campus of ZHC (erstwhile Delhi College) at Ajmeri Gate and now in the new campus opposite Ram Lila Ground, Jawaharlal Nehru Marg. He uses potatoes and sweet potatoes. We love his chaat. Came across ds blog while googling for sum restaurant. And btw dr is a russian restaurant in delhi called Bline. 1. A channe bhature place, operaing out of a hole in the wall (to be more precise a window) in the metropolitan cafe nr Kashmiri gate. So as you we too have started a small effort on our own for the foodies in Delhi. I hope if you could see the website and discuss and put it on your blog and help other foodies in delhi. BTW i’m in your ignore list in orkut . @ Prabhu (Sicko) and Ryan: Thanks for the appreciation! 🙂 Now if only I could get to watch that episode — no Travel Channel here in India, you see! Hopefully someone will put it up on youtube. I never try momo. so,I will surely go at momo point in kamla nagar. I am fond of eating that’s why can you add here some other extra kulfi and ice cream points except roshan di kulfi b’coz I have alredy tried it. 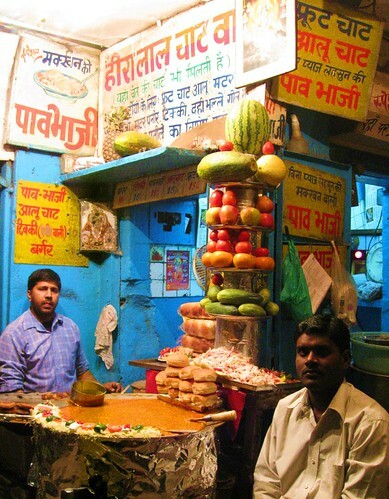 There is one more establishment for kulfi in Old Delhi known as S. S. Supplies, 689, Kunde Walan, Ajmeri Gate, Delhi-6. have you chaps stopped eating since Feb ????????? did you by any chance get a copy of the Andrew Zimmern’s delhi episode ? They are going to air it today in the travel channel . I can make a copy for you, if you want one. Thanks “Sicko”, but they already sent me a DVD of the show. Before they did that, I was also able to download it from the iTunes Store. Ever tried Daulat ki chat in Dilli 6? A.W.E.S.O.M.E. Andrew’s show in Delhi had a dish that was made out of milk, which he likened to a mikk souffle (if i am not wrong). What was that dish and where do u get it? That dish was Makhan Malai, also called Nimish or Daulat ki chaat, In delhi you can get it in the Chawri Bazaar road, where u can see 2-3 vendors till afternoon during winters only. Hira Lal or even Jugal Kishore used to be good, but their quality has been going down over past 7-8 years…..if you want to try the really good stuff, try the guy who sits with his Bamboo tokra on the corner of Sita Ram Bazar, just besides Ashok Chat Corner…….his spices are really good and ask him to use his special peela masala for the really tangy chat…..problem with Hira lal or jugal kishore is that they use substandard black masala which is mostly over roasted jeera and coriander…..and leaves a bitter after taste……real chat should tickle the palate and should leave it yearning for more……one can also try the chat at the rehdiwala outside the Krishna Dry Cleaners in Darya Ganj market…..from 6:00 pm to 11:00 pm….his is really good as well. Is EOID site on Orkut closed or temporarily suspended. I dont seem to be able to access it. Can some body enlighten ? i am writting a story where the father is a free lance writer and he travels through India etc. and gathers recipes from countries. Old Delhi is a favorite stopping place. this is the first time I have heard of kulle, can i use it in my story? I’m so glad I came across your site. I did see the show with Andrew and would love to check out Delhi on an extended stay. Unfortunately I’ll only be in the city for about 7 hrs on a layover. But I plan on using all my time to explore and try different foods. I have absolutely no idea which area to visit for that short amount of time but would love to have a tip on maybe where to grab dinner and a busy market/area to soak up the vibe. Any suggestions would be very much appreciated! Hira Lal to be verygood. Which is the best Kulle and chat in Delhi. I probably have heard the name, but I never really knew what kulle actually is. Also I am wondering if this site has been deserted? It would be a sad thing for me atleast having discovered it just months ago. I wish I had internet when it was active.